We've designed a new tool to make buying classroom tables easier than ever. All our tables are British made and come with up to 5 year guarantee. Select all the table options you require and we will confirm the item code and price ready for you to add to your basket. We have three different types of table. Our standard table come with a 5 year guarantee. Our standard table with addition of two Gratnells trays under the desk and supplied with a 5 year guarantee. Our value table come with a 2 year guarantee. Our circular table has a 1000mm diameter. Our rectangular tables come in two sizes: 1100mm(w) x 550mm(d) and 1200mm(w) x 600mm(d). Our square table is 600mm(w) x 600mm(d) . Our trapezoidal table is 1100mm(w) x 500mm(d). Our tables conform to the BSEN-1729 standard. BSEN-1729 is the European standard for classroom tables, desks and chairs in UK schools. It is the only current and valid standard for classroom furniture. 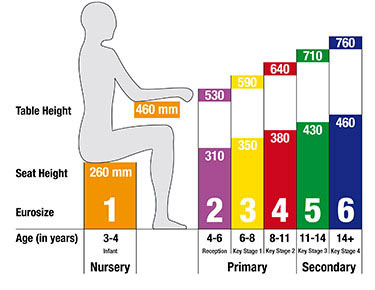 It addresses concerns for health and safety with classroom furniture with regards to back pain and concentration levels of children needing to improve. MDF edging is very economic. Durable laminate is placed on an 18mm MDF top. The table-top edges are polished, lacquered and “bull-nose” shaped. A solid 7mm edge that is injection moulded to the table during the manufacturing process gives complete protection to the table top , which gives complete protection and comes with a lifetime edge guarantee. A high impact and resilient spray PU edge in Light Grey, which is impossible to pick off. Durable laminate is placed on both faces of an 18mm MDF board and then a 2mm ABS strip is applied to give a neat matching edge. All of our frames are powder coated, made from 1.5mm thick tube with 25mm square tube legs and have a minimum 5 year guarantee. Crush bent frames are great for areas where you need flexibility. These tables stack neatly, back to front, taking up less space. Welded frames are great for tables that are in constant use. It is a very strong method of construction and the frame sits completely within the footprint of the table top. This makes it easier to arrange the tables in groups and to mix in different shapes. These tables stack in a spiral. Our frames come in either Black or Grey. 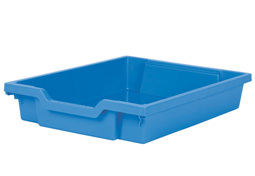 Our standard tables with trays have 10 different tray colours available. The trays are shallow and come from Gratnells.